Fort Monument (1865-1868) – Originally a Butterfield stage station along the Smoky Hill Trail to Colorado, troops were first sent there in November 1865 to protect the station and travelers from Indian attacks. Formerly called Monument Station for the castle-like rocks to the north, the stage station was sometimes referred to as Antelope Station. Once the soldiers were posted there, the post was also nicknamed Fort Pyramid, once again for the monolithic rocks. The post saw one engagement on August 22, 1867, when a freight train of about 40 wagons was attacked in the early morning by several hundred Sioux and Cheyenne Indians. Sheltered behind their wagons, the teamsters were able to withstand a siege of more than 30 hours. They were reinforced the next day by a government freight train with a detachment of soldiers and finally forced the Indians to leave. The troops were withdrawn in June 1868. The site has no buildings remaining and can only be identified by a few low mounds where dugouts once were. 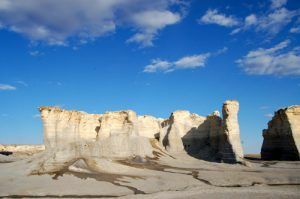 It is located near the Gove County, Kansas boundary about one mile southwest of Monument Rocks.